Did you know that April is National Soyfoods Month? I had no idea! 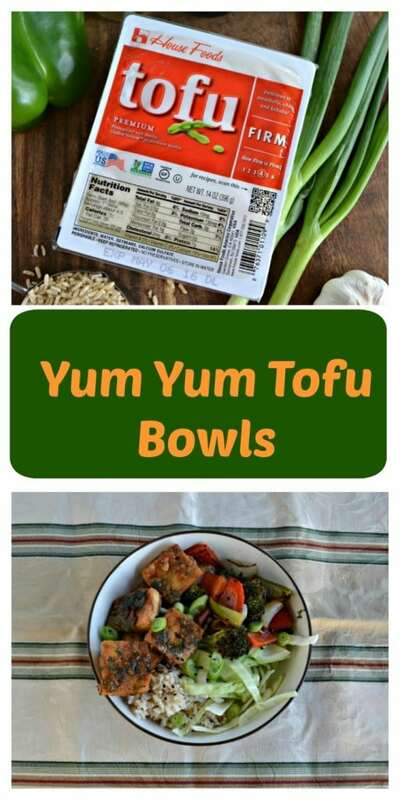 Since we eat a lot of soy in our house I am excited to be partnering with the Soyfoods Association of North America to bring you a delicious recipe using a soy product. Before I get to the recipe let me tell you about a few of our favorite soy products. As I’m sure you already know, we love tofu in this house. What you might not know is that I didn’t even try tofu until the age of 23. I met my husband at that time and he asked if I’d ever eaten tofu. I told him I hadn’t so he made a baked Buffalo Tofu for me. I’ll be honest, while I liked the flavor I did not like the texture. We tried again with grilled tofu and the firm texture was much better for me. Fast forward more then a decade and we eat tofu at least once a week. It’s a great vegetarian source of lean protein that fills me up unlike many other vegetarian products. I prefer firm or extra firm tofu because of the texture. I find that to get the best texture you should always squeeze out the water ahead of time. I have a tofu press which makes this really easy to do. 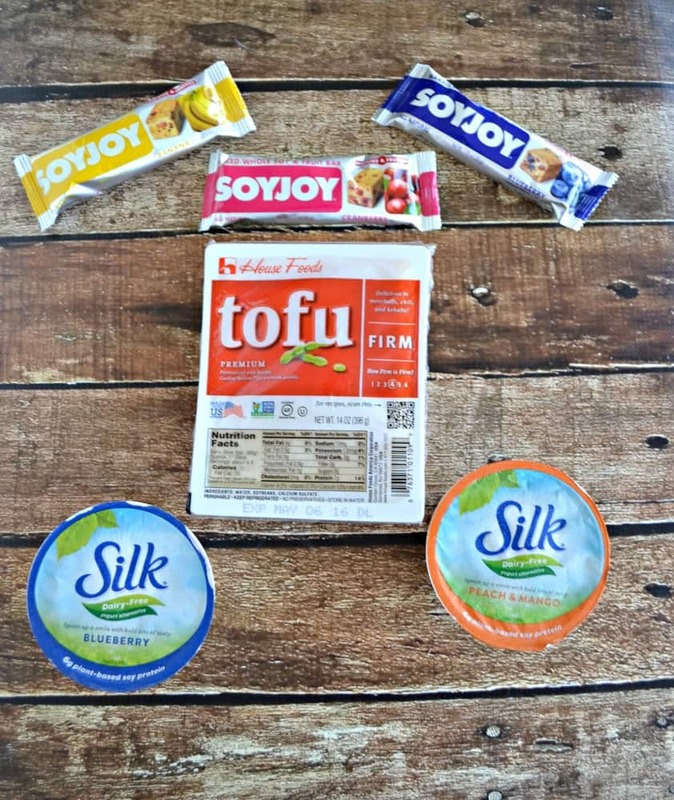 Plus, tofu takes on the flavor of whatever you cook it with so you can add just about any sauce to it! My husband is a big fan of soy sausage. He likes making them for breakfast and putting them on a muffin with a slice of cheese. We also enjoy SOYJOY whole soy and fruit bars when we are on the go. They are inexpensive, taste great, and give me energy before a big workout. Did you know that soybeans are packed with high quality protein and are produced in an Earth-friendly way? That means that soybeans aren’t only good for people but they are good for the Earth too. If you haven’t tried soybeans in some form get out and do it! Now back to my recipe. I’ve been in a bit of a tofu rut lately and I’ve been making the same recipes over and over again. 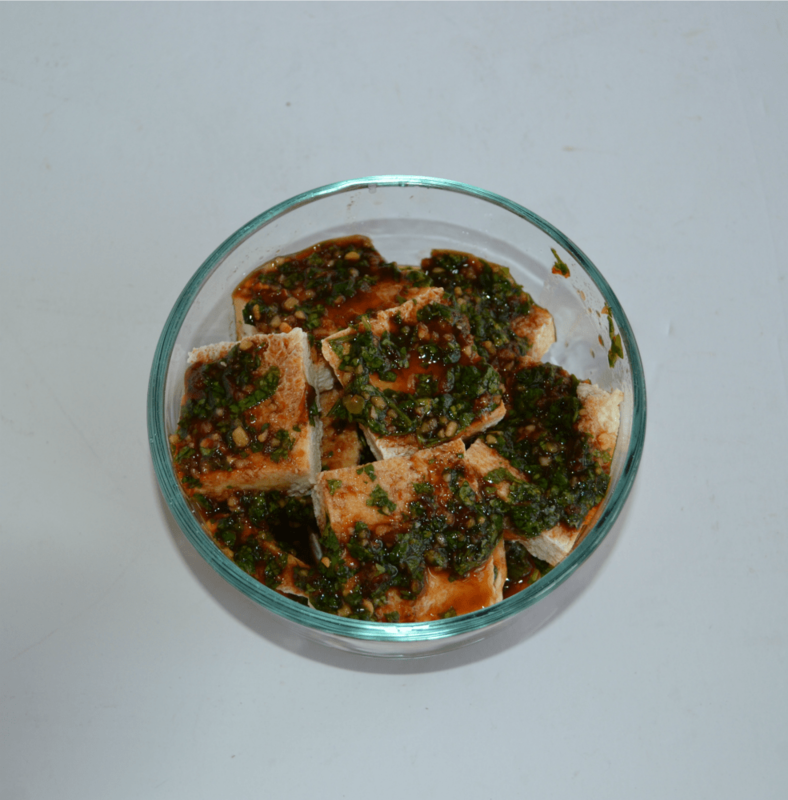 For several years I made Chili Lime Tofu 2-3 times a month. 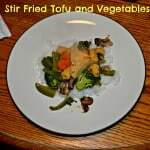 Most recently I’ve been making tofu fries with broccoli steaks 2-3 times a month. However, I get bored after eating the same thing over and over again for months in a row. Recently I’ve been making different types of tofu bowls. 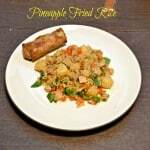 These usually include tofu in some type of sauce, either rice or quinoa, and vegetables. I made a BBQ Tofu bowl a few weeks ago and not only was it delicious but it was so colorful too. 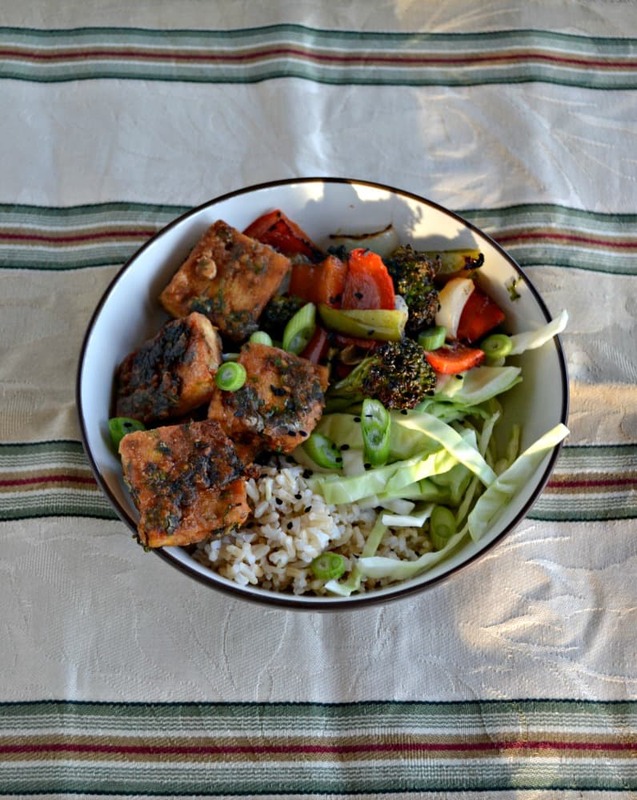 I broke out my recipe folder the other night to see if I could find any other tofu bowls. My recipe folder is HUGE. It’s a collection of every recipe I’ve clipped from my Cooking Light Magazines, Bon Appetit Magazines, Good Housekeeping, Family Circle, Sauveur, and all my other cooking magazines. It’s a large collection and the recipes are busting out of it. 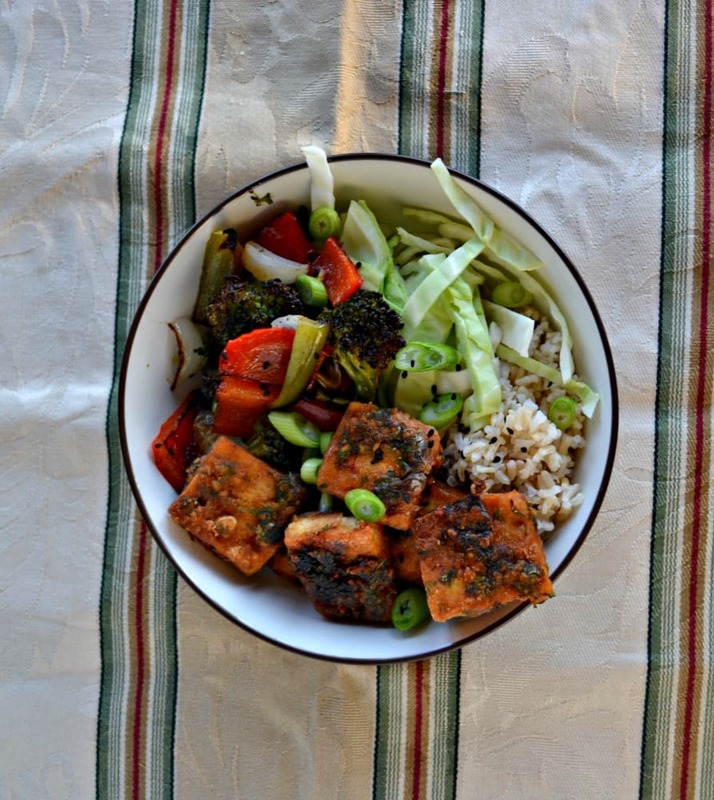 I took out a small section and would you believe in the first 10 recipes I looked at I found this Yum Yum Tofu Bowl? Score for me! 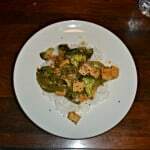 It sounded really tasty with tofu in a spicy sauce served with raw cabbage, roasted vegetables, and rice. I made a lot of changes to the recipe but the basic idea is still there. This is a quick dish to make but I have to remember to marinate the tofu ahead of time. That’s my biggest mistake with this dish. The recipe calls for the tofu to be deep fried which you can do but I chose to put a thin layer of oil in the pan and just surface fry the tofu. I thought it turned out just as good. The tofu gets crispy and is spicy with a lot of herb flavor. 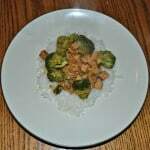 It’s served over top of rice, roasted broccoli, peppers, and onions, along with raw cabbage. It’s topped off with scallions and sesame seeds. I love all of the flavors together in one bowl. It’s a delicious vegetarian weeknight meal. 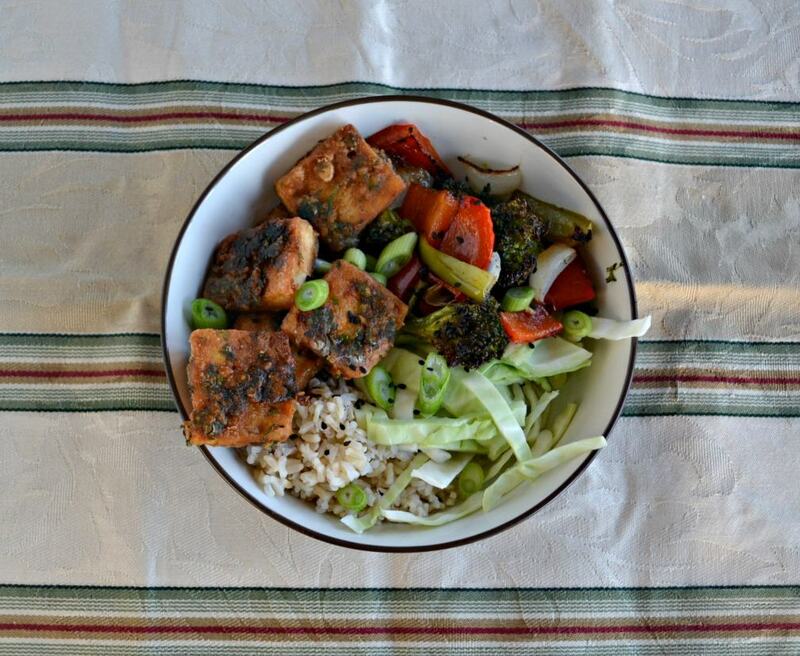 Enjoy a vegetarian meal of spicy fried tofu, roasted vegetables, raw cabbage, and rice all in one delicious bowl! Cut the tofu into 3 slices. Cut each slice into 5 pieces. Place the tofu in a bowl with the garlic, soy sauce, chili paste, rice vinegar, cilantro, and ginger. Mix well, cover, and refrigerate for 2-4 hours. Place the broccoli, peppers, and onions on a baking sheet and toss with the olive oil, salt, and pepper. Bake for 10 minutes, stir, then continue baking for 10 minutes. Remove from the oven. Pour the olive oil in a deep skillet. Heat over medium high heat. 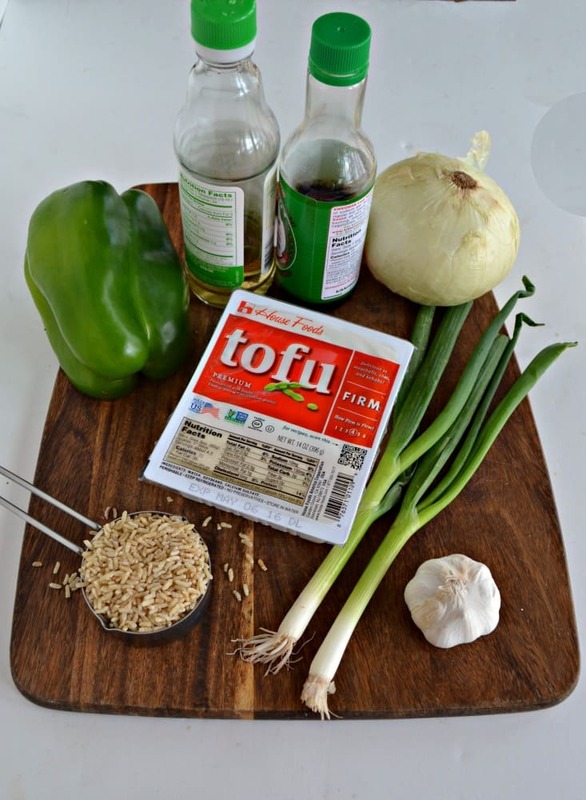 Working in batches, remove the tofu from the marinade and toss with the cornstarch. Shake off the excess. Place the tofu in the hot oil and cook for 3-4 minutes per side. Remove to a paper towel lined plate to drain. To assemble the bowls place ½ cup of rice in each of 4 bowls. Divide the roasted vegetables between the bowls. Add ¼ c. of few cabbage. Divide the tofu between the 4 bowls. Sprinkle each bowl with scallions and sesame seeds and serve hot. Adapted from Bon Appetit, April 2015.